Brock Eastman, co-author of one our family’s favorite Imagination Station books, found out we love the Imagination Station books so he asked if he could send us one of his other books. And I’m so glad he did! From the moment I picked up Taken, I was pretty sure it was going to be a book Kathrynne would enjoy. Boy, was I right! 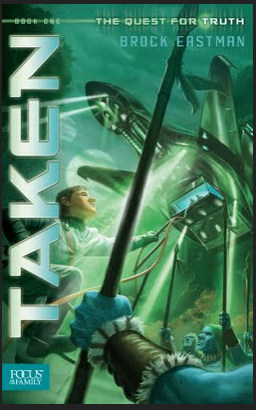 If your family is looking for a family-friendly science fiction novel, you’ll definitely want to consider getting a copy of Taken. 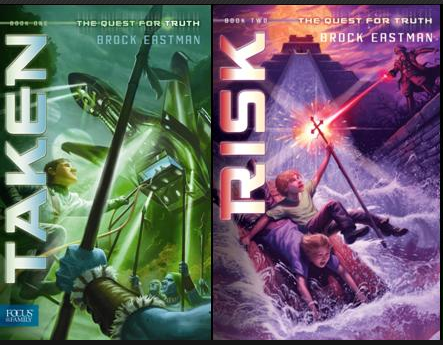 We’re already anxious to get started on the just-released second book in the series — Risk. Special Offer! Get a Signed Copy of Taken or Risk for Just $7.49 + Shipping! I was chatting with Brock the other day and I mentioned I was going to be doing a short review and plug for his book on my blog. Well, being the generous guy he is, he offered to put together some special prices on signed copies of his books. There are limited numbers of these available, so if you’re interested, I wouldn’t hesitate to jump on this deal — it’s the best deal you’re likely going to find online. In fact, Brock’s not making a penny by offering these: he just wanted to bless my readers with a great deal! So, what are you waiting for? Go get your signed copy of Taken or Risk for just $7.49 plus shipping. You can also get a copy of HowlSage for $9.99 plus shipping or a copy of The Imagination Station Series Book #5 for just $2.99 plus shipping. Looking for more? Read more posts about Books We Love. « Ask the Readers: What are some of your most frugal recipes? Does anyone know what age this is geared towards? Amazon says ages 13 and up — though Kathrynne is 7 and she really enjoyed it (she’s also big into gadgets and spy stuff and mystery, though, so that’s probably why she enjoyed it so much at a younger age!). Great! I have a 13 year old boy who hates to read. I thought this might interest him. We’ll give it a try. I bought Taken for my 10 year old’s bday and he is reading it now. He loves it and can’t put it down. Went ahead and ordered Risk through your special price…he’s buying it with birthday money! Thanks so much. It’s wonderful to have morally pure books for our kids to read that are so exciting. Thanks! My son LOVED the imagination station books. Thanks for all your support. Thanks Crystal for such a great review. God is truly awesome and has opened every door to this series being published. Feel free to follow me on facebook to see the inside scoop on Unleash (Book 3)! Can’t wait for Book #3. Keep on writing — you’ve got some big fans at this house who’d be very disappointed if you didn’t! I just ordered my son a copy and he is really excited. After returning a stack of books due to inappropriate content, I am looking forward to having my son read a book by Christian author. Thank you for the recommendation. I hadn’t heard of these books before. My 10-year-old son just read Taken and loved it! It’s incredibly hard to find quality books for his age range and reading level. No worries at all with this one. I highly recommend it for a summer reading list.